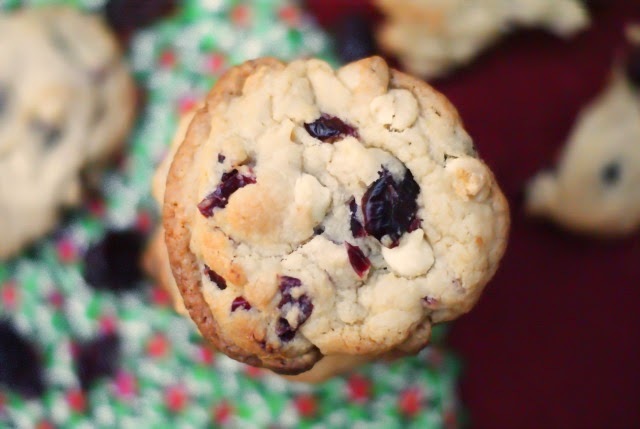 Cranberry White Chocolate Chip Cookies are thick, soft, and just a little chewy, with white chocolate chips and cranberries in every bite. These cookies are, hands down, my new favorite cookie! They are soft on the inside with slightly crisp and chewy edges and they have the perfect combination of flavors. Loads of white chocolate chips pair perfectly with the sweet but slightly tart cranberries...so tasty! I hadn't planned on making these particular cookies, but when I bought my cookie baking supplies this year, I just bought a bunch of different kinds of chips and decided to figure it all out when I got home. Not my usual plan of attack when doing any kind of holiday baking or cooking, but somehow I never managed to get around to sorting through my recipes and planning it all out. I ended up making classic chocolate chip cookies, Chocolate Peanut Butter Squares, and pretzels stuffed with peanut butter then dunked in chocolate. When all of that was done, I still had a bag of white chocolate chips to use. I decided to go with the recipe on the back of the bag. Seemed like the logical thing to do at the time! Instead of using nuts, I subbed the cranberries because that's what I had on hand and, let me tell you, that was a very good decision. They came out fantastic and really festive with the ruby-colored cranberries. I decided after making these cookies that they would be the perfect recipe to share for Patience Brewster's virtual cookie exchange that I was invited to participate in. If you're not familiar with Patience, she is an artist of handcrafted ornaments and figurines that are whimsical, unique and simply lovely. Check them out! And definitely make these cookies. They just might turn out to be your new favorite cookie, too! Cream the butter and sugars until fluffy. Add the vanilla and eggs, one at a time, and beat well. Blend in the flour, baking soda and salt. Stir in the white chips and cranberries. Drop by rounded teaspoon onto cookie sheets lined with parchment. Bake for 10-12 minutes. Source: Adapted from a recipe found on the back of the Ghiradelli White Chocolate Chips bag. 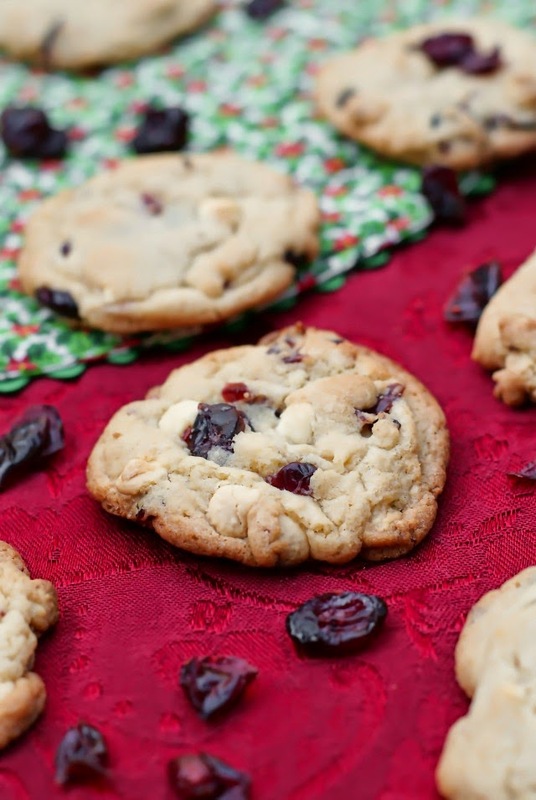 You can never go wrong with the combination of white chocolate and cranberries, so I can imagine how delicious these cookies must have tasted! It's one of my favorite combos!